Located in Dallas Dallas Uptown/Downtown Apartment (040) is an apartment boasting an outdoor pool. 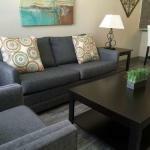 The apartment is 600 metres from Arts District Dallas. The kitchen is equipped with a dishwasher. A TV is offered. Other facilities at Dallas Uptown/Downtown Apartment (040) include a barbecue. Deep Ellum is 700 metres from Dallas Uptown/Downtown Apartment (040) while AT&T Performing Arts Center is 700 metres from the property. The nearest airport is Love Field Airport 8 km from the property.